Photos via Google Books, Getty Images. 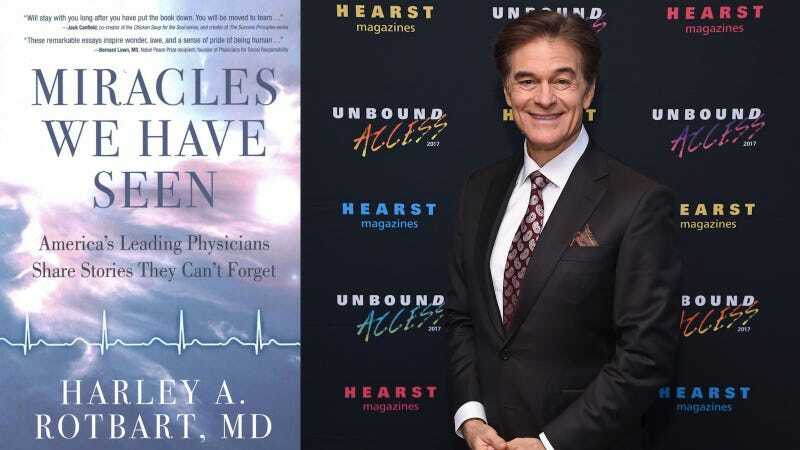 Doctor Oz, who vies daily with Dr. Phil and Steve Harvey for the title of “most annoying media personality unleashed by Oprah,” has signed on as executive producer for a TV show being developed at CBS about medical miracles. Yeah, that sounds about right. The currently untitled project would follow two surgeons, one who is grounded in hard data, and the other who pursues a dual mission of faith and science. It is based on the nonfiction best-selling book “Miracles We Have Seen: America’s Leading Physicians Share Stories They Can’t Forget” by Dr. Harley A. Rotbart. Oz will serve as an executive producer on the project along with his wife Lisa. Grant Thompson will write and executive produce. Joby Harold and Tory Tunnell will also executive produce under Harold’s Safehouse Pictures banner. CBS Television Studios will produce in association with Sony Pictures Television and Safehouse. So, basically The X-Files, but for the power of prayer instead of aliens and monsters of the week. It will run for 24 seasons and make eleventy jillion dollars.